This product is perfect for teachers trying to navigate through the Common Core, and/or make the switch to Standards Based Report Cards. 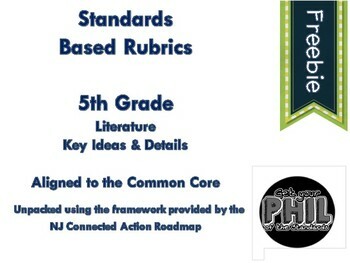 Following the framework set forth by the NJ Connected Action Roadmap (CAR), I have unpacked the 5th Grade Literature: Craft and Structure and Key Ideas and Details standards. 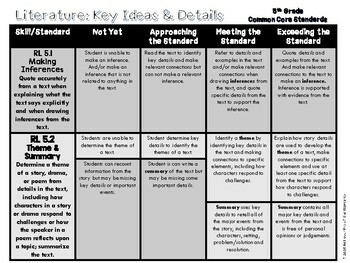 I started with the common core standard, underlined the nouns (what students need to KNOW and UNDERSTAND), and the verbs (what students need to be able to do.). 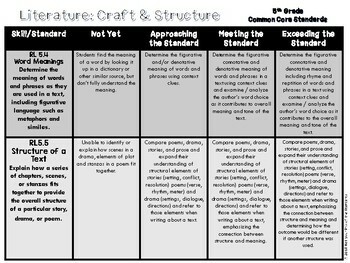 While you can use these to build objectives, grade assignments or assessments, or communicate to parents the progress of their students, the options are endless!! 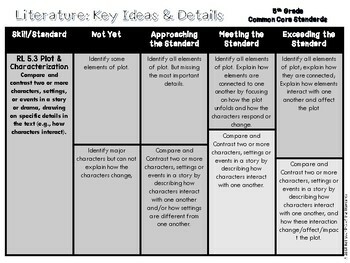 I send these home after every unit of study, and use these as a conferring tool during Reader's Workshop/Writer's Workshop. This is a freebie of what is soon to be a bigger product containing all of the standards!